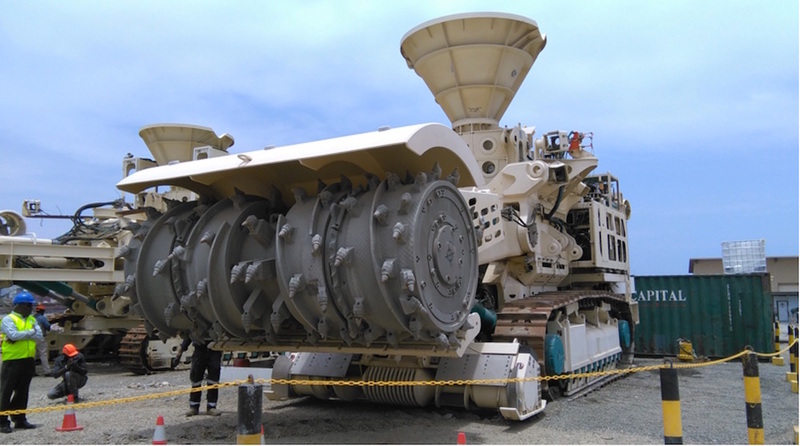 Canadian company Nautilus is busy showing off its seabed mining machinery to a small select group of people from New Ireland and East New Britain – landowners and community leaders are unimpressed. Coastal communities across the Bismarck Sea under the umbrella of the Alliance of Solwara Warriors claim that Nautilus and the PNG Government do not have their consent to go ahead with experimental seabed mining in the Bismarck Sea. “Who are these leaders from New Ireland province that Nautilus has hand selected?”, said Jonathan Mesulam of the Alliance of Solwara Warriors. “In June this year, more than 300 hundred people attended forums held in Namatanai and Kokopo hosted by Caritas Kavieng and the Archbishop of Rabaul. Papua New Guineans are worried about the impacts of this Canadian company’s experiment”, claimed Mr. Mesulam. 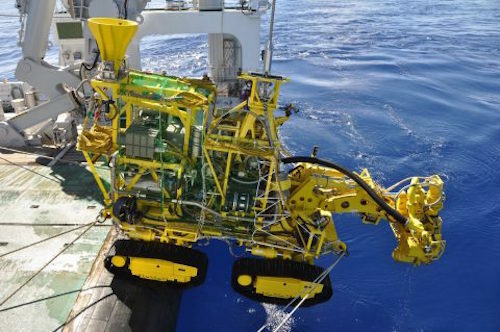 Japan has carried out the world’s first mining and lift test of hydrothermal deposits at about 1,600 meters depth in the ocean near Okinawa, the country’s Ministry of Economy, Trade and Industry and the Japan Oil, Gas and Metals National Corporation (JOGMEC) confirmed earlier this week. The success of this test, which reportedly extracted zinc and other metals, should be a major step toward establishing the technologies required for ocean mineral resource development. In addition to the results of this test, Japan plans to carry out economic evaluation such as resource amount assessment and environmental survey. According to the Ministry, the first test confirmed that there is no serious influence on the surrounding environment. “We are planning to comprehensively promote efforts towards commercialization of submarine hydrothermal deposits by promoting economic evaluation and environmental investigation,” the Ministry said in a statement. These giant machines will crawl across the ocean floor, tearing up the seabed in a strip mining operation and Nautilus expects us to believe there will be zero impact! Our politicians may have been idiots to agree to this crazy experiment but Nautilus should not treat all Papua New Guineans as ignorant fools!!! Nautilus Minerals has boldly stated that Solwara 1 Deep Sea Mine will have zero impact on marine life and coastal communities in New Ireland Province. This was affirmed during a site tour of Nautilus’s Sea Floor Productions Tools outside Port Moresby (SPT) by local leaders from New Ireland Province. Nautilus said the technology employed for the project did not require explosives or chemicals and are confident there will not be any environmental impact. Several local and provincial leaders from New Ireland Province, arrived in Port Moresby on Monday to see first hand the sea floor Production Tools being tested at Motukea Island outside the capital city. The tour is part of Natuilus’s continuous effort to educate leaders and New Irelanders about the operation of the SPT’s which they assured will have no impact on the marine life and coastal villages. Nautilus Vice President of PNG Operations, Adam Wright, gave a presentation about how the mining operations will be carried out, highlighting the technology used that will avoid any adverse impact. “There will be no impact on the fish, there will be no impact on the reef and on the coastal communities,” said Wright. The leaders had a close look at SPT’s which will be used on the sea floor of the Solwara 1 Project. They included the bulk cutter (BC) and collecting machine (CM). The auxiliary cutter (AC), the third in Nautilus;s arsenal, was undergoing live tests while a tour of the control room was also included. One local leader said after the tour that while they appreciate Nautilus’s efforts in educating them on how their operations will not affect the livelihoods of the people, he said they are still unsure but will only see the outcome. He added they have agreements and understandings in place to ensure Nautilus carry’s out its business with the interest of the people at heart. “Gavman givim tok orait pinins lo displa mine so mipla bai lukluk tasol. But yes mipla gat ol disla (agreements) where bai mipla toktok long em,” said John Ezra of Ward Four Namatanai LLG. While the Mining Lease for the project had been branted [sic] in 2011, production equipment for the project is still in development. While tests on the SPT’s are still underway , the ‘Riser and Lifting System (RALS) has just been completed and undergoing assessments while the mssive Production and Support Vessel (PSV) is still in development. Nautilus expects first shipment from Solwara 1 Mine to begin in 18 months time after putting the project together for the last 10 years. PNG miner K92 has resumed underground operations at its Kainantu gold mine five weeks after mobile plant was damaged when a group of landowners entered the mine during discussions over grievances about the mine. K92 says the minor damage to infrastructure and plant at the Eastern Highlands mine has been repaired. First ore is expected to be trucked next week, regaining pre-incident levels by end-Oct.
CEO John Lewins says K92 has signed a resolution with the Bilimoia Landowners Association and Mineral Resources Authority that allows it to build up underground production targeting commercial production in the near-term. 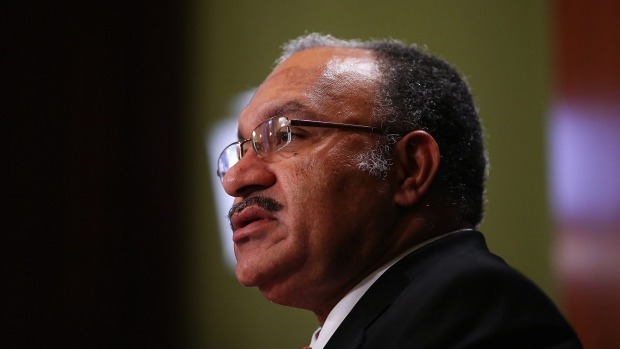 Papua New Guinea Prime Minister has conveyed deep concern over the declining health of the world’s oceans. Speaking at the United Nations General Assembly in New York, Peter O’Neill said global fish stocks were being decimated and ecosystems destroyed by human activity. He said while Pacific countries were feeling the greatest impacts, the problem was of global relevance that required greater global action. Mr O’Neill said many PNG communities were being forces to abandon their traditional homes because the decline of ocean health means loss of food and livelihoods for them. According to him, PNG is doing what it can to address the problem – an integrated national oceans policy has sought a coherent cross-agency approach to ocean governance. But he stressed the need for more action on reducing harmful human activities in relation to oceans. Mr O’Neill welcomed the first-ever Oceans Conference in support of Sustainable Development Goal 14 on conservation and sustainable use of oceans. 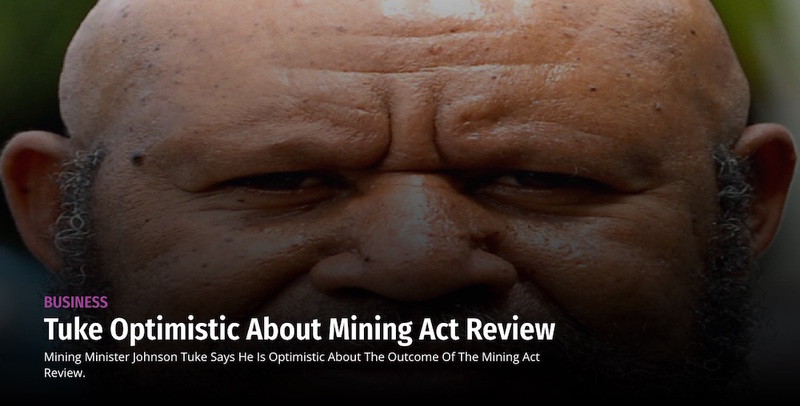 Mining Minister Johnson Tuke says he is optimistic about the outcome of the Mining Act review. Mr Tuke told the Papua New Guinea Chamber of Mines and Petroleum this during his ministerial meeting yesterday. He told the Chamber officials that despite his proposal to review the Mining Act which has created a lot of anxiety within the industry, he is optimistic of an outcome that would be accepted by affected parties. He said as per the review of the Mining Act, his ministry and the National Government were working in line with government priorities to address it. He said Prime Minister Peter O’Neill will meet with the Secretary for Department of Mining Harry Kore for a briefing on the review of the Mining Act this week and that the Mineral Resources Authority (MRA) and the Department of Mining will also conduct a power-point presentation next week for all industry stakeholders. His meeting with the chamber was to enhance the ministry’s relationship with the industry at which the minister said he is more than happy to hear what the chamber has to say regarding the mining industry in Papua New Guinea. “All economic ministries have been given a 100-day ultimatum to perform by the National Government and therefore I would like to work closely with you, the Department of Mining, Mineral Resources Authority and all extractive industry companies in order to realise the government’s agenda. “My plan is to visit all mining projects in Papua New Guinea as minister responsible and I would like to meet with company officials and discuss matters of importance,” said the Minister. He also announced that during his term in the ministry he will take on board the Wafi-Golpu and Frieda River mining projects and ensure that these important mines are operational. THE Bougainville Copper Limited (BCL) is working to implement its staged redevelopment plan for a new Panguna mining project and further build community support. “We are actively building positive relationships and will continue to increase our presence in Central Bougainville over the coming months as we expand our community engagement activities,” said Executive Manager Justin Rogers. Rogers led a BCL community engagement team with Buka-based Bougainville Manager Ephraim Eminoni and two senior project officers where they spent four days at Arawa, Central Bougainville. The team met local stakeholders earlier this month which coincided with the opening of two major events – the national boxing championships and the 2017 Bougainville Chocolate Festival. Rogers said Bougainville’s cocoa industry looked to have a very bright future and had earned international recognition for the quality of its produce. BCL considered the development of primary industries and other areas of potential, such as tourism, as critical to Bougainville’s future economic success, of which employment was fundamental.